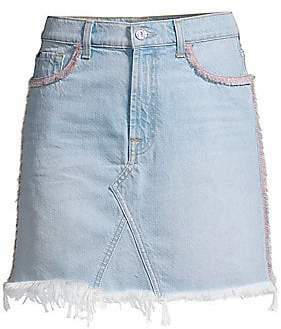 7 For All Mankind Mini Skirt in Blue. 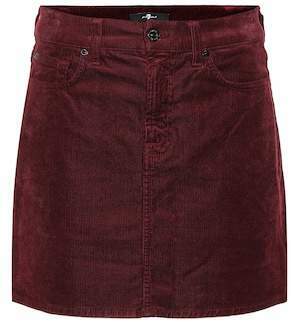 - size 24 (also in 25,26,27,29,30) 7 For All Mankind Mini Skirt in Blue. 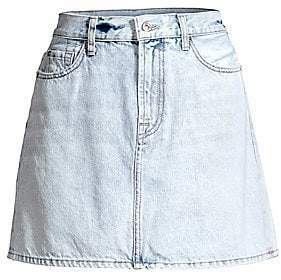 - size 24 (also in 25,26,27,29,30) Self: 100% cottonContrast: 70% poly 30% cotton. Unlined. Zip fly with button closure. 5-pocket design. Light whiskering along front. Intentionally distressed areas throughout. Skirt measures approx 14 in length. Imported. SEVE-WQ30. AU9232066. Born in Los Angeles, California, 7 For All Mankind was the first company to bring premium denim to scale. 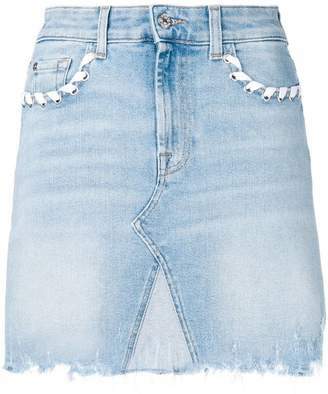 7 For All Mankind quickly earned an immediate following for its innovative use of fabrics, fit and finishes in denim. Male celebrity fans include Ashton Kutcher, Ryan Reynolds and Penn Badgley. 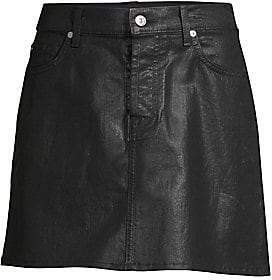 7 For All Mankind Coated Mini Skirt.